My latest Christmas tree recommendation. Form: Distinctive open upright growth when young. Medium sized mature tree to 40 to 60 feet in height, broadly pyramidal crown, develops into a stunning flat-topped tree with horizontal branching. 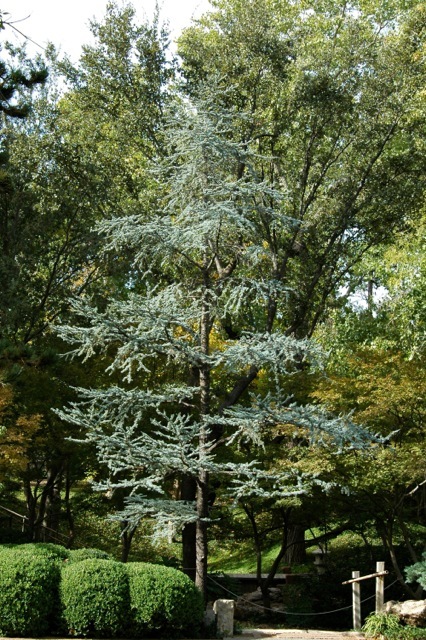 Foliage: Evergreen needles, blue-green to silvery blue, generally under 1 inch long, occur singly on new growth, but tightly whorled on spur shoots. Flowers: Species is monoecious; male cones 2-3 inches long on lower part of tree; female cones thicker and erect, purplish, borne on top sections of tree. Fruit: Short, stout upright cones with deciduous scales, 2 1/2 to 3 inches long, 2 inches wide, waxy purplish green while developing, turning brown at maturity, mature over two years. Twigs: Slender, finely hairy, brown with numerous spur shoots, branches droop with age. Bark: Initially smooth and gray, later darkening and developing fine flat scales. Management: Relatively easy to grow in a wide range of soils. Notes: Makes a interesting living Christmas tree.